Rooftop Reviews: Hank Williams on The Lost Highway. 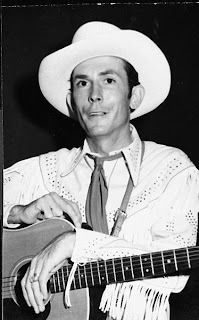 Did you ever hear about the death of Hank Williams, Sr., on a back highway early on the morning of January 1, 1953? I would not be born for another 20 months, yet this legendary singer/songwriter has left a lasting impression upon the world in which we live. I don't ever recall a time of my life in which Hank Williams, Sr. has not been somewhere in the background; whether in movie, song, or his considerable influence on the music we call rock and roll. It all goes back to Hank. John Lennon used to carry the complete works with him on cassette. Bob Hope, after trying to follow him on stage during a "package tour" in the late 1940's said that he would never follow him on stage again. His songs were all about the pain of living, and the humor, locked away within that pain. His recording career ran only 5 years, from 1948 until his death on the first day of January 1953, yet he left a catalogue of about 267 songs, many of which are still sung today. Born September 17th, 1923, in Mt. Olive, Alabama, he would be a superstar by age 25, and dead by age 29. And in between he lived a life of physical and emotional pain. Long considered to be the Father of Country Music, he got his first guitar at age 8. Named Hiram King Williams at birth, Hank learned to play his guitar under the direction of a local black man whom everyone called Tee Tot. Tee Tot was a street singer of the blues variety and young Hank was fascinated by the sounds he heard the old man coax from his guitar. But even more than the sound of the strings, what caught Hank's ear were the painful lyrics sung in an almost joyful manner. It was like Church, you took your pain and turned it into music. Your despair became your salvation. Early in his teens, Hank began performing around the Greenville area of Alabama. Shortly after that, the family would move to Montgomery. In 1937 his mother opened a boarding house there, and by 1941 Hank had formed his first band, The Drifting Cowboys. They even got air time on the local radio station, WFSA. Known as "The Singing Kid", he did mostly cover versions of Roy Acuff songs and other popular numbers of the day. He would remain with WFSA for the next 9 years, even after becoming a star. In 1943 he met his first wife, Audrey, while playing a "medicine show" near Banks, Alabama. Within a year they were married and living in his mother's boarding house. She became his manager as his status and reputation grew. But he couldn't seem to break out of Alabama and onto the national scene. This was about to change. Traveling to Nashville, he was determined to meet Fred Rose, Roy Acuff's publishing partner. Rose was immediately taken with both Hank's guitar and voice. 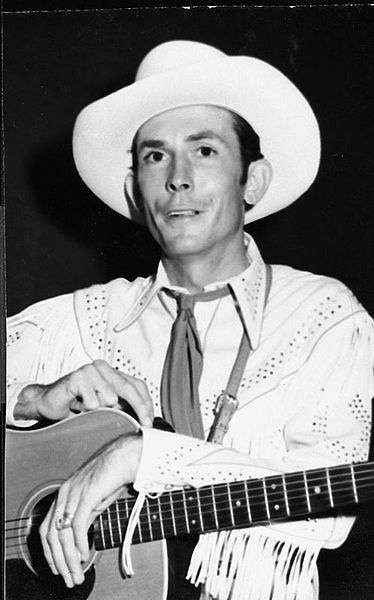 He arranged for Hank to record two songs for Sterling Records, "Never Again" and "Honky Tonkin'" in February 1947. On the strength of those two recordings he was signed to MGM Records and Fred Rose became his manager, as well as his producer. "Move It On Over" was the first big hit for Hank with MGM in 1947. By 1948 he was a member of the "Louisiana Hayride", both on radio and on the road. His career was soaring. When he did a cover version of "Lovesick Blues" in 1949, he hit Number One and stayed there for 16 weeks, crossing every demographic line imaginable. When he performed the song live at The Grand Ol' Opry, he did 6 encores. I don't believe that record has ever been topped. But, with all of the fame and success came trouble. Hank's drinking problem, which had been lurking just beneath the surface, began to rear its head again. The long separations from home while on tour; the fights when he was home; all began to take a toll on his marriage to Audrey. But the final "nail in the coffin" happened in late 1951 on Hank's farm in Tennessee, where he was hunting. He fell, re-igniting an old back injury. There was another tour coming up and so he did what so many performers have done before and since. He turned to painkillers, and finally morphine, to deal with the pain. He became almost instantly addicted to the morphine. He was also drinking heavily again. In early 1952, Hank and Audrey separated for the last time. Yet, 1952 would be one of his most prolific and successful periods. "Honky Tonk Blues", "Half as Much", "Jambalaya", and even my favorite "I'll Never Get Out Of This World Alive" were written and recorded in this final year of his life. They all went to the Top Ten. But he continued drinking and doing morphine. Most of his time awake was spent drinking, drugging and playing with guns. By August of 1952 he was fired from the Grand Ol' Opry, mainly due to his drunkenness. He was told that he could return once he was sober. The shame of it all was that no one knew how little time was left. This infuriated Hank to the point of his becoming even more reckless; finally losing his band; as well as his friends. Still working "The Louisiana Hayride" provided him with money to live on. His royalties were being handled by an attorney as part of the divorce from Audrey. He began using local pick up bands, which further reduced the fees he could have been earning. It was in the fall of 1952, just 90 days before his death, that he married 19 year old Billie Jean Eshlimar, a policeman's daughter. At this same time, he was expecting a child with a woman named Bobbie Jett, and signed an agreement to support the baby once it was born. By December of 1952 he was also having heart trouble, mostly due to the morphine, booze, cigarettes and life on the road. His doctor was a man named Toby Marshall. On December 31st, 1952 Hank was scheduled to fly to Canton, Ohio to perform on New Year’s Day. The weather was bad and the flight was cancelled, leaving no other option than to travel by car. Hiring a chauffeur, he headed for Ohio in his new Cadillac. Just before leaving "Dr." Marshall gave him 2 injections for the ride. One was Vitamin B-12, the other was a large dose of morphine. Hank got in the back seat, toting a bottle of whiskey, and the chauffeur started out for Ohio. Early on the morning of January 1st, 1953 the chauffeur was pulled over for speeding. The policeman noticed that the passenger looked more dead than alive and escorted the Cadillac to a West Virginia Hospital where he was pronounced dead at 7 AM New Year's morning. His last record was "I'll Never Get Out Of This World Alive." His recordings continued to sell after his death, and all of the new songs that had been awaiting release charted in the Top Ten throughout 1953. For me, Hank Williams has always been there in the background, a place where I can store my pain, face it, or laugh at it. His music is the same as the blues, only the tempo is different. Tonight is New Year's Eve. I'll go out to dinner, watch a movie, and stay up a bit later than usual. But sometime, after everyone else has gone off to sleep, I will probably still be awake, imagining that I am out there, somewhere on the Lost Highway. And if I tilt my head just right, and listen really hard, somewhere around dawn, I just might hear that Lonesome Whistle Blow.